The 2006 season was a particularly rough one on the corps weather-wise. A blistering heat wave in the Great Plains states forced many corps passing through the region to curtail rehearsals. 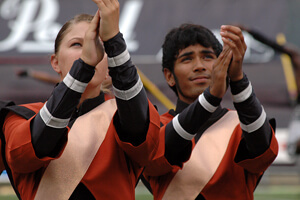 Many shows were delayed or cancelled due to heavy rains and lightning, including the Masters of the Summer Music Games in Murfreesboro, Tenn. For the World Championships, DCI went back to Madison for the seventh time and found a Camp Randall Stadium that had been dramatically modernized and enlarged since the last visit four years earlier. The season featured a number of interesting races among Division I (now called World Class) corps that would eventually not be in the Finals. For the second year in a row, Colts finished just one corps away from performing on the last night of the season. Blue Stars surged past Crossmen the final week to take 14th place, all the more impressive as this was the corps' return to Division I after more than two decades in Division II and III. Both Crossmen and Capital Regiment finished less than a point behind the corps from La Crosse. Mandarins held on to a Semifinals spot, knocking Southwind out of the Friday berth the corps had recaptured in 2005. Joining Southwind in sitting out of the Semifinals was Cascades, Magic, Pacific Crest, Esperanza and Pioneer. The 17th place Mandarins advanced into Semifinals on the basis of being a top-17 finisher in all captions except Visual Performance, Brass and Music Ensemble. It was the corps' fourth year in Division I. The production, "Rhythm Nation," explored the most primal of music's building blocks with pulsating contemporary musical selections from the symphonic hall, jazz clubs and pop venues. For this, the corps' color guard had some extensive training in progressive dance, taking it into territory the corps hadn't deeply explored in the past. The title of the show was inspired by "Rhythm Nation," the 1989 Janet Jackson album that combined rhythm and blues with industrial music, rap, sampling and drum machines, influencing R&B music for several years. There was also percussion influence from "Din Daa Daa" of German dance music percussionist George Kranz, which hit the Dance Music/Club Play charts in 1984 and featured an early use of "drumspeak." The show started with an introductory drum riff from Luis Garay's "Martilla." Garay is an Argentinian drummer and composer who was responsible for introducing much of his country's percussion heritage to Americans via the Luis Garay Percussion World Ensemble, based in Washington, D.C. This actual opener was Al Di Meloa's "Egyptian Danza," updating the world music of old Middle East melodies with a contemporary hip jazz. The Brazilian singer, guitarist and composer Nando Lauria wrote the driving-yet-lyrical "Back Home" (heard in the video clip). Lauria started guest performing with the Pat Metheny Group in the late 1980s and became a full member in 2005. As such, his music has a definite Metheny flavor that is easily confused with that of his mentor. Steve Reich wrote "Clapping Music" in 1972 for two performers doing nothing but clapping their hands. The minimalist piece was based on a single rhythm that continually repeated, with the second clapper shifting the rhythmic figure a single eighth note every few measures until both parts suddenly realigned, resulting in the sudden end. The Mandarins' treatment featured clappers up front and an enhancement of the rhythm spread across all the snare drummers. Nando Lauria's "Episode: Prelude" was a lovely ballad that took the rhythmic heat down several levels and let the ears cool off. The mood stayed relatively calm for "Tell It All" by Pat Metheny and Lyle Mays, off the album, "First Circle," winner of the Grammy for Best Jazz Fusion Performance in 1985. But things quickly heated up for "This Way Up" by Metheny and Mays, leading the show to what many may have first thought was a rousing conclusion. Putting down their horns at the front of the field during a front ensemble rendition of "Tell It All," the entire brass line started clapping in a reprise of the Reich work. On the last note, all members threw their arms in the air and shouted, treating an exclamation mark as the end of the last rhythm. For this week only, you can save on the DVD that contains this complete Mandarins performance, along with all corps from Volume II of the 2006 Division I DCI World Championship DVD set.